NEWPORT BEACH — College friends and Southern Californians Mark Ward, 46, and Billy Dutton, 52, just completed a unique journey aboard a unique boat — and in the process, they helped expand public awareness about the health of the world’s oceans. 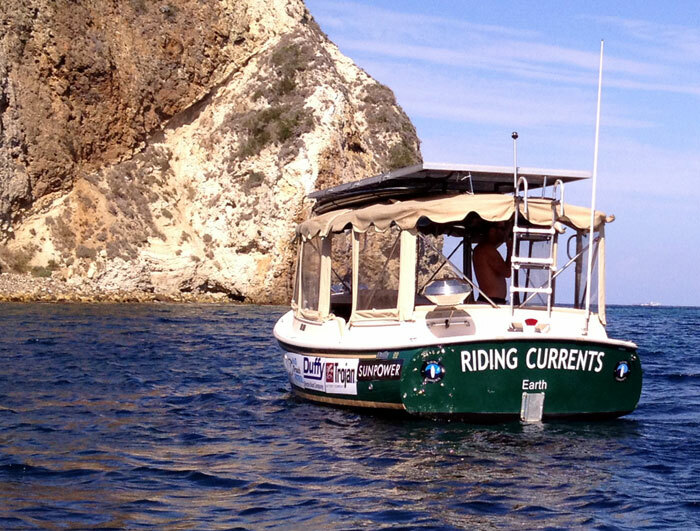 Their 348-nautical-mile journey aboard a solar-powered electric Duffy boat came to an end Oct. 20, as the two had completed 12 stops in 13 days of travel down the Pacific Coast from Santa Barbara Harbor to Ensenada, Mexico. Dubbed “the Electric Surf Safari,” the expedition was designed, in part, to raise awareness of the dangers plastic pollution poses in ocean waters. It also allowed Dutton and Ward — both surfers — to experience an adventure with some epic surfing sessions mixed in. Their 22-foot Duffy, dubbed Riding Currents, was outfitted with solar panels above the canopy top, and a custom surfboard and paddleboard rack directly underneath the panels. Additional battery power was added that kept the vessel charged through the longest legs of the journey. While most boat owners only take electric boats out during calm weather and stay inside harbor breakwalls, Dutton and Ward motored through a small craft advisory in open water while heading out to Santa Cruz Island, and through heavy swells and 20- to 25-knot winds outside San Diego Bay. When they weren’t enduring angry seas, the team would work on taking water samples from different areas along the coast, observing water quality in harbors and picking up waterborne pollution when they could. During stopovers in harbors, the team scheduled events to talk about their journey and their plastic pollution message at schools, yacht clubs, businesses and museums. The Log caught up with Dutton following the conclusion of the Electric Surf Safari, where he expounded on the trip’s highs, lows and difficulties — and its ultimate rewards. The Log: What was the trip like overall? Dutton: “Well, the expedition ended up being so much more than we originally conceived, on so many levels, but let’s touch on the real star of the show first: the Duffy. “The Riding Currents project started out simply with a quest: “To boldly go where no Duffy had gone before.” In pondering what would be a challenging yet somewhat prudent distance and time to go on the expedition, we mainly focused on how long each leg was and the farthest distance we felt comfortable testing the boat in the open seas. The Log: Any complications during the journey? Dutton: “Well, what we didn’t fully contemplate — more than the distance between each port — was that the real challenge would be what was between each port: lots and lots of kelp and lobster traps. “Kelp was the one thing, outside of a swell coming over the gunwale, that could cripple our Duffy. We knew there would be some, but there was much more than we expected. “But, this is actually where our Duffy came through with flying colors. Normally, any boat traversing the coastline at 4.6 knots would have been foiled trying to zig and zag through the maze of kelp. The Log: How did the collecting of ocean water samples go? Dutton: “We collected water samples for Heal the Bay at 16 predetermined locations that they were monitoring. The good news is that 15 of those spots passed with very low numbers, when evaluating the levels of certain bacteria. The Log: How was plastic pollution tested? Dutton: “We collected a number of samples, pulling a Manta Trawl that was provided by the Algalita Marine Research Institute. “The trawl is a device that looks like a floating wing, being towed behind the boat at about 2 knots for around 30 minutes per testing session. Attached to this floating wing is a trailing 8-foot net that narrows down to a tightly woven sampling sock at the end. “The contents of that sock were saved in containers and are being evaluated for levels of micro particles of plastics back at Algalita’s lab in Redondo Beach. The Log: Did you find anything unusual on the trip? Dutton: “A couple things stood out: The most disturbing was the decaying body of a pelican we found that still had the plastic bag that killed him wrapped around its head. “The other was a gallon-size plastic water jug that was floating in a marina for so long, it had a fungal growth the size of a basketball growing on it. We could only wonder how many people had to have seen it floating in that harbor and passed on trying to remove it. The Log: You held speaking events and demonstrations at various ports along your route. How did they go? Dutton: “We had seven events that were held at various yacht clubs and a museum that all enthusiastically hosted us. “We were joined by Marcus Eriksen, founder of the Five Gyres Institute; Marieta Francis, executive director of the Algalita Marine Research Institute; Serge Dedina, founder of Wildcoast; and 10-time Olympic champion swimmer Gary Hall. The Log: You discussed targeting the younger generation on the plastic pollution topic. How did the kids respond to the “change your straw from plastic to paper” message? Dutton: “The good news is that the younger generation we spoke to not only understands the issue, but also is very passionate about wanting to do something about it — to be part of the solution to plastic pollution. The Log: What did you learn out there? The Log: Any weather issues during the trip? Dutton: “Talk about Murphy’s Law — the two legs that had us most concerned were hands-down the worst weather days of the two-week trip. “Our first real test took place on the second leg of the trip, from Ventura Harbor out to Santa Cruz Island and back to Channel Islands Harbor in Oxnard. A small craft advisory came across the radio about an hour out, and we hadn’t seen another craft since we left the harbor. We were encountering 20- to 25-knot quartering headwinds that were churning up the ocean with whitecaps lapping over the bow. We didn’t get relief from the islands until we reached the shelter of Scorpion Anchorage. “After that, we enjoyed calm weather until we set out on the 11th and longest leg of the journey, from Shelter Island in San Diego Bay to Puerto Salina, Mexico. It started with a pre-dawn departure needed to ensure we would make the small port in unfamiliar Mexican waters before sunset. “Before we reached the last shipping lane navigation lights, we were encountering 20- to 25-knot headwinds churning up some angry seas that we couldn’t see until they hit the bow. We came back in the harbor until dawn, to let us see what was coming at us. We didn’t make it much farther outside the harbor on the second attempt before we heard over the radio a call from the Coast Guard coming to rescue the crew of a capsized ship not far from us. The Log: With the weather issues, plastic pollution sampling and presentations did you get any surfing in? Dutton: “We were hoping for more, but we did have two near-epic surfing days. First, when we came around the point to Trestles, just as an overhead set took everyone by surprise and cleared out the lineup, we knew we would be hitting San Onofre on a great day. We had some friends meet up with us there for a day we won’t soon forget. “The second was when we dropped anchor off Point Loma and surfed for the first time at a place called Dolphin Tanks. “We had an amazing day at Oak Street in Laguna Beach when SUPCO and Zero Trash held a beach and ocean sweep. An army of paddleboarders showed up on a perfect Indian summer day.